We have been successfully manufacturing, exporting & supplying all types of BOPP Tape Cutting Machine, BOPP Tape Slitting Rewinding Machine since last 25 years from Ahmedabad, Gujarat, India. We are the winner of 3 times National Award and 2 times International Award for Quality manufacturing. KEW Manufacturers, exports & supplies BOPP Tape Slitting Rewinding Machine, BOPP Tape Cutting Machine also known as BOPP Tape Slitting Machine working width 300mm suitable to slit adhesive tape from 12mm onwards. The Machine consists of M S Side wall, DC/AC Motor with drive, Unwinder, Rewinder system, Auto stop counter meter, Control Panel, etc. 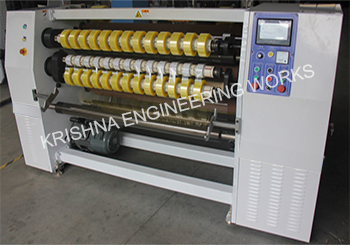 BOPP Tape Slitting Rewinding Machine Manufacturer, BOPP Tape Cutting Machine, BOPP Tape Slitter Rewinder Machine Supplier with high speed features. • Knurling Roller Complete – 5 Nos. • 7.5 H.P. A.C. Main Drive Electric Motor with Control Panel with the On‐Off switch, Speed Regulating, Emergency Stop MCB Contactor in the Panel.